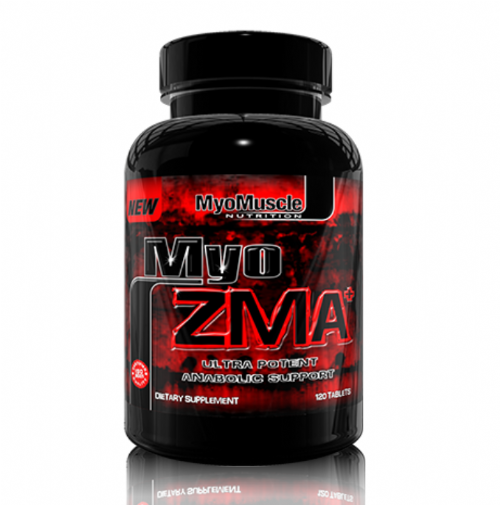 If you want the most potent ultra concentrated ZMA on the market look no further than MyoZMA+ While most alternative ZMA formulas offer a total of just 490.5mg of ZMA per serving MyoZMA+ offers a massive 632mg, making it our most potent ZMA ever! The ultra concentrated Zinc Magnesium Aspartate formula found in MyoZMA+ is clinically proven to increase both testosterone and IGF-1 levels! In fact a double-blind study found that ZMA triggered an increase in testosterone levels of 32.4% over placebo! The benefits of MyoZMA+ don't stop there though! The ultra potent vitamins and minerals found in MyoZMA+ are essential to muscle growth, cellular activity, protein synthesis, immune function, lipolysis (body fat breakdown), athletic performance and more! When you punish yourself in the gym with grueling set after set your body demands more vitamins & minerals, especially those found in MyoZMA+. Don't deprive your muscles of what they demand or limit your growth and progress, take it to the next level with MyoZMA+ Grow, Recover & Repair While You Sleep! Suggest Use Take 4 tablets 30 to 60 minutes before sleep. For optimal results avoid taking with milk or foods high in calcium. "Brilliant product was only getting around 2 hours sleep at a time then waking up and back to sleep. Started using these and went to 5-6 hours unbroken sleep felt loads fresher upon wakening aswell. Would defanitly recomend these for anybody not able to sleep straight through"
"I don't go to the gym but I was recommended ZMA to help me sleep from a friend who trains. I looked around and this was the best value and strongest I could find. Sleep is much better and my dreams are very interesting ;)"
"Best ZMA product I have tried! Previously had Metrx and PHD ZMA but always felt like I needed to take more than the recommended dose, not with these! Libido is through the roof and I sleep much better. Well worth the money!"